Last November marked 10 years since I started the WyEast Blog, way back in 2008. It was a pretty hopeful year, as you may recall, followed by some very progressive reforms for how our public lands are managed. And my, how things can change — elections do have consequences! So, as always, the work continues as we weather another round of political attacks on our hard-fought protections for public lands. Much has changed in WyEast country over the past 10 years, too, but certainly not my commitment to a better future for Mount Hood and the Columbia River Gorge. I’m frequently asked “do you reallythink Mount Hood will become a national park?” and my response is always the same, “a little more every day!”Why? Because despite the currently bleak situation in Washington D.C., we’re (finally) witnessing the start to a changing of the guard in generational leadership at all levels of our society. The Millennials are here! What will history say about the Baby Boomers as they (reluctantly) hand over the reins to a younger generation? For all they have given us in their epic contributions to art and culture, they have also been surprisingly awful when it comes to conservation, woefully lacking in both courage and imagination. It’s true the Millennials are overdue in taking the reins, but since twice delivering the first African American to the U.S. presidency (a man who the Boomers voted overwhelmingly against, history shall note), they have steadily expanded their presence on the local, state and national political scenes. The 2016 elections represented the beginning of what will become a tidal wave in coming years, too. By wide margins, Millennials are genuinely committed to conservation and sustainability, more balanced in their personal lives in how they manage ambition and status, and much less materialistic and consumptive than their elders. The numbers prove this. And thus my confidence that the Millennials’ turn at governance can (and will) return us to the bold conservation legacy of past eras and previous generations of leadership. The pendulum will swing, once again, and I believe that expanding our national park system will be part of that renaissance. The two snags featured in the very first article on this blog… but what about the big fir on the right? Sometime that year, both snags on the left side of the photo were felled, possibly for firewood, a common activity in that area. At the time I was dismayed at the senseless loss of a couple of valauble and (to me) beautiful snags. Mount Hood’s old ghost trees are essential for wildlife and forest health, after all! And thus, my first article began what would become many looks at the lesser-known and under-appreciated corners of WyEast country, all in celebration of our magical mountain and gorge! Today, the view from this spot on Dufur Mill Road is still much the same, minus the old snags. Here’s what it looked like a couple of weeks ago (below), where you can pick out individual trees in the background that appear much the same. The large Douglas fir on the right side of the original photo still stands, too, but what about the apparent change in height of this tree between the above and below photos? The only true constant in the forest… is change! The changes in this favorite spot of mine are a good metaphor for so many places on Mount Hood and in the Gorge over the past ten years, where the only constant is change. This article explores some of the changes, plus a rundown of the most read and least read articles on the blog. Hope you enjoy the look back! Including this retrospective, I’ve posted 184 articles on the blog since November 2008, ranging from the incredibly obscure (my favorite!) to the surprisingly popular. In the first five years, visitors grew gradually to a couple thousand annually, then abruptly jumped to 30,000 in 2013 and 60,000 in 2014! Since then, visitors have hovered between 70,000 and 90,000 annually. A decent share also click through to the Mount Hood National Park Campaign website, and who knows? One of those visitors might be the future congresswoman or senator who introduces a bill to make Mount Hood and the Gorge a national park! That’s the goal of an “idea campaign”, after all — and why I started the blog. But blog metrics don’t really tell the full story, as a select few posts have been the major drivers in visits over the years. These posts continue to pop up each week in the blog stats, years after they were first published. At the top of that list is an article debunking the many persistent myths about ticks that continue to circulate among the hiking community. I published “Ticks! Ticks! (10 Common Myths” in April 2013, and it’s the main reason for the big jump in traffic that year that has since continued. The article now has 173,000 views and counting — and that’s great news, as ticks present a growing health risk in the Gorge now that Lyme disease has spread to our region. Nobody likes ticks… but people do like this article! Right behind ticks in our apparent collective anxiety is poison oak, and a companion piece called “10 Common Poison Oak Myths” is thus the second most read article on the blog. A lot of bad information circulates online among hikers on both the risks and treatment for poison oak exposure. This article was posted in 2012, before the tick article, but caught fire after the piece on ticks began to drive search engines toward the blog. Today, the poison oak article has had 78,000 visitors and shows up every week in blog stats. The 2017 Eagle Creek Fire kicked off a series of articles covering the aftermath of the fire. The first article featured some of the earliest views into the burn as seen from the Washington side of the Gorge, just after the smoke had cleared. This article was widely shared in social media, with 23,000 views and counting. Later articles spotlighting the burn were based on State of Oregon aerial reconnaissance photos that provided exceptional detail of the devastation at iconic places in the Gorge and the nearly immediate signs of recovery that was already underway. One of these revealed a massive cliff collapse at Punch Bowl Falls in early 2018, just a few months after the fire. Perhaps more shocking than the Eagle Creek Fire, itself, were the dual cliff collapses at Metlako Falls and Punchbowl Falls on Eagle Creek. We will never know if the cliff collapse resulted from the effects of the fire, but when the State of Oregon aerial surveys revealed the collapse, it came as a shock to anyone who knew this spot. More than 25,000 readers have viewed the article and it continues to be visited regularly. While it’s great to see a big response to an article, truth be told, my favorite posts are among the least read. This describes mostof the posts on the blog, of course! One of these lesser-read pieces was in 2010, when I posted a proposal to restore Warren Falls, a virtually unknown spot near Starvation Creek that had been brutally altered by Highway Department engineers in the 1930s. 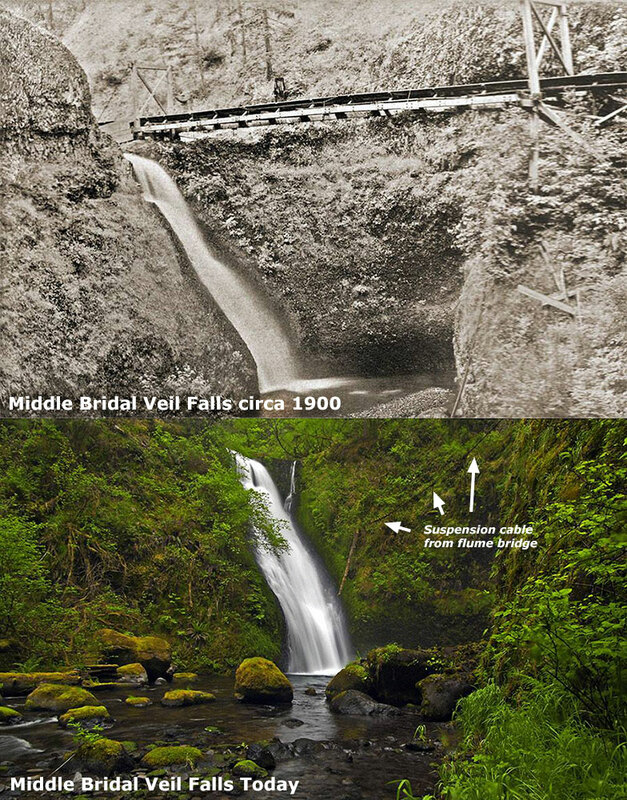 I had long been saddened to see how this beautiful spot had been manhandled by the same Highway Department that had gracefully navigated other waterfalls in the Gorge with beautiful bridges, viaducts and overlooks, and hoped that ODOT might incorporate restoration of the falls into a major effort to reconnect the original Historic Columbia River Highway. This became a bit of a crusade for a few years, including a featured spot on OPB’s Oregon Field Guide, but in the end, ODOT wasn’t interested in owning up to their crime against nature (and as I pointed out in one of the follow-up articles, the diversion was a clear violation of state statute, too!). Score another one for the highway builders, but I remain hopeful that someday we will undo this travesty. Warren Falls comes (briefly) alive in 2014! In the meantime, a vestige of the original falls appears a few times each winter when ODOT’s diversion dam and bypass tunnel are overwhelmed by high runoff, bringing Warren Falls back to life, if only briefly. In happier ODOT news, an August 2012 article proposing a “Boot Loop” transit service around the mountain and through the gorge seemed far-fetched at the time, but ODOT has since operated transit in the west end of the Gorge and helped fund transit to Timberline Lodge. Currently, a “round the mountain” transit study is underway to explore the potential for completing the loop. That’s great news! Not such a goofy idea after all..? The Gorge Express and Mount Hood Express bus lines are general purpose, too, whereas the “Boot Loop” idea was more narrowly aimed at recreation. The broader transit service we’re now seeing on the ground is far better, providing essential service to places where basic transit connections were long overdue. Kudos to ODOT for moving beyond their highway roots and bringing much-needed transportation alternatives to the mountain and gorge! Mount Hood and the Columbia River Gorge have seen some epic changes over the past 10 years, perhaps most notably the Dollar Lake Fire on Mount Hood’s north slope in 2012 and the Eagle Creek Fire that burned much of the Oregon side of the Gorge in 2017. But there were many other significant changes, too, albeit somewhat overshadowed by the big fire events. The following are a few “then and now” highlights of these notable changes in WyEast country over the past ten years. Global warming? Absolutely. Despite the frustrating, science-defying (and completely cynical) state of denial coming from the White House and Republican Party, bright red warning flags are showing up all around us, including on Mount Hood. As the photo pair below shows, the Eliot Glacier continues to recede at an alarming rate, as do the rest of Mount Hood’s twelve glaciers. I’ve marked a couple of prominent rock outcrops adjacent to the lower Eliot Galcier icefall to show how the “firn” line has retreated. The firn line is the point in a moving glacier that marks equilibrium, with the glacier is accumulating ice above the line and losing ice (melting) where it flows below the firn line. As the photos show, the lower icefall (just above and left of the outcrop marked “A”) is notably smaller and darker, with debris carried within the glacier now exposed by melting at this level due to the rising firn line. Both photos were taken in late summer, when summer melting was at its peak. The once-permanent snowfields on the margins of the glacier are also noticeably smaller and seem doomed in the near future. Permanent snowfields are the most vulnerable ice features on the mountain and a good visual indicator of the speed in which global warming is melting our glaciers. While future generations may forgive us for failing to actually slow or stop global warming, they surely will never forgive us for willful denial of its existence as a human-caused crisis of our own making. Let’s hope we can make up some lost ground in the near future, with the Millennial generation finally taking charge. The changes to the Eliot Glacier are also being felt downstream, no more so than in the upper reaches of the Eliot Branch canyon, where a more volatile glacial outflow is rapidly carving into the once glacier-covered valley floor, constantly changing the landscape. 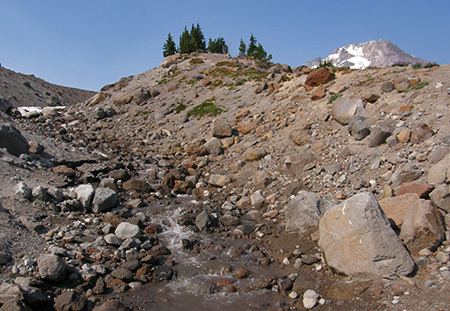 In 2006, the stream flooded once again, greatly deepening the canyon and making it unsafe to cross for hikers on the Timberline Trail. This situation languished for nine years, with many hikers choosing to scale the crumbling canyon wall (shown below) with the aid of a worn rope anchored to a boulder! Not exactly the New York Times, but I’ll take it! The newly reconnected trail drops steadily from Cloud Cap Inn to a section of the raging Eliot Branch that has (somewhat) stabilized, and can be reasonably crossed in the summer months. Though there are no immediate plans for a trail bridge here, the Forest Service moved large boulders in the stream to serve as stepping stones, hopefully making the crossing a bit safer for hikers. The restored trail opened in 2017. Moving down to the Hood River Valley, the iconic view of Mount Hood from this field along Laurance Lake Road (below) looks much the same today as it did in 2008, albeit with some logging on private land in the distance. What you can’t see in the 2008 view is that it was captured just a year after voters approved Measure 49, which reversed 2004’s deceptive Measure 37. This earlier measure would have almost certainly brought resort development and luxury McMansions to the Hood River Valley. …still pretty much the same ten years later! Even better, this farm has since come under the ownership of a member of the Parkdale Valley Land Trust, and is now even more likely to remain unchanged for the foreseeable future. Which, in turn, means that a spot that hasn’t change since the 1950s (below) might look much the same in the 2050s. That’s a great legacy being carried forward to future generations. Here’s another view of the Parkdale area in the Upper Hood River Valley from Middle Mountain, a mostly county-owned forested ridge that separates the upper and lower valleys. From this spot, the most notable change is a silver band of ghost trees marking the 2012 Dollar Lake burn, clearly visible along the northern shoulders of the mountain. The Dollar Lake Fire was the third in rapid succession (following the Bluegrass Fire in 2006 and Gnarl Ridge Fire in 2008) to burn the slopes of Mount Hood. As jarring as the changes may be, these new burns provide a front-row seat to the rapidly recovering forest, a timeless and essential cycle that has been disrupted by the Forest Service policy of aggressive fire suppression over the past century. State and federal land agencies have only just begun to rethink their approach to fire moving forward, a change in culture that will take many years to fully achieve, especially in the era of climate change. One unexpected benefit of the fires on Mount Hood was preparing those (like me) who love the mountain and gorge for the devastating Eagle Creek Fire that raged through the western Columbia River Gorge in September 2017. The Mount Hood fires helped many who understood the abstract benefit of forest fires come to grips with the emotional reality of seeing a favorite place changed, and begin to appreciate the stark beauty in the burned landscape and witness the unfolding forest rebirth. For the past year, thousands of volunteers with organizations like Trailkeepers of Oregon (TKO) have been working with the Forest Service and Oregon State Parks to begin digging out miles of burned trails in the gorge. Last November, the Forest Service officially opened the first of these cleared trails, including the iconic Larch Mountain Trail that follows Multnomah Creek, giving hikers their first look at the changed landscape, and a chance to expand their own understanding and acceptance of fire in our forests. Similar scenes can be found throughout the Eagle Creek Burn, where the fire generally left a beneficial “mosaic” pattern, with heavily burned areas mixed with largely intact forest. 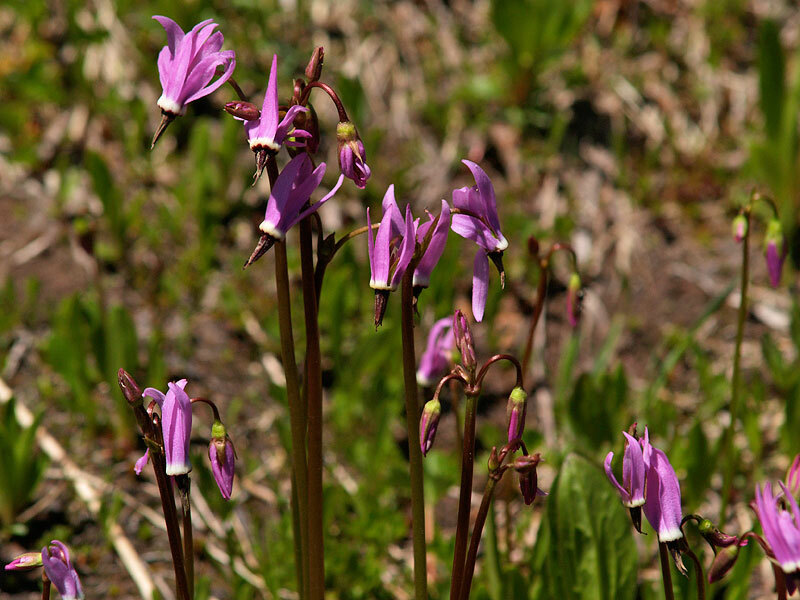 These areas are expected to recover quickly, with healthy patches of surviving forest helping adjacent burned areas recover by reseeding, providing cover for wildlife and creating shade. But there are exceptions, especially Oneonta canyon, where the burn was especially catastrophic. The recovery in these places will span decades. Thus far in this 10-year retrospective article, the focus has been on big changes brought by nature (albeit with an assist from man), but there have been plenty of changes brought by humans over the past ten years, too — both good and bad. Let’s start with the bad (and ugly). Tragically, corporate timber behemoth Weyerhaeuser became the major private land owner in the West Fork Hood River valley over the past decade, taking ownership of private forests that had long been held by Longview Fibre (and then briefly by a Canadian equity trader). 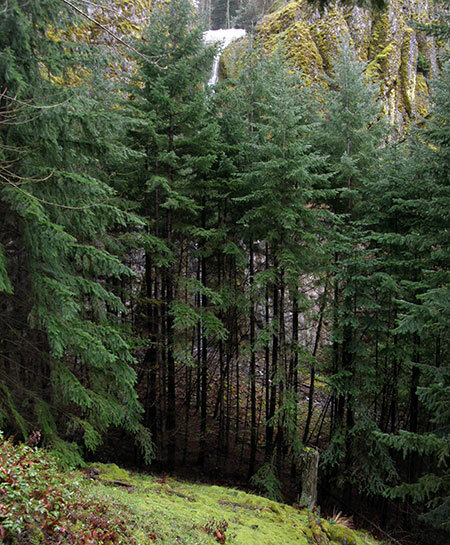 Though Longview Fibre had greatly accelerated logging in the 2000s, Weyerhauser has ramped up the destruction and embarked on a complete liquidation of the forests along a West Fork. Their purported “sustainability” mission is laughable in the modern area of chasing stock prices with massive, unsustainable clear cutting. Not seen in these photos are the miles of shoddy logging roads cut into steep slopes in order to haul out the logs and the millions of gallons of liquid herbicide sprayed on the slopes of the West Fork canyon to kill whatever vegetation managed to survive the logging show. Modern corporate logging is about exterminating native forests and replacing them with hybridized tree farms, make no mistake about it. While it’s tough to see healthy forests cut on such a reckless scale, it’s also possible that Weyerhaeuser’s new lust for quick profits over sustainability could tempt the company to sell their cut over lands to the public in the interest of protecting the West Fork valley over the long term. After all, it will take decades for these forests to recover, and Weyerhaeuser seems to have lost patience with timelines on that scale. The sooner we can reclaim these precious lands for the public, the better.Watch for a future blog proposal on that subject! On to more positive developments! 2018 also marked the grand re-opening of the Old Vista Ridge Trail, a wonderful “lost” trail that winds north from the Vista Ridge Trailhead to a dramatic view of Mount Hood’s north side from a rocky spur known as Owl Point. The trail was unofficially reopened in 2007 by volunteers from the Oregon Hiker’s forum and maintained ever since, a project that led to the formation of Trailkeepers of Oregon (TKO). Over that time, it became clear that the trail needed to be officially recognized by the Forest Service in order to be properly maintained over the long haul. After much discussion, the agency signed an agreement with TKO in 2017 to adopt the trail, caring for it in perpetuity. The grand re-opening was originally planned for the fall of 2017, but the Eagle Creek Fire intervened, with much of the north side of Mount Hood closed to the public for fear of the fire moving south into the West Fork valley and toward the mountain. …replaced with official Forest Service signs last summer! In July of last year, the rescheduled re-opening finally happened, with an official “cutting of the survey tape” with loppers and a log saw by TKO’s executive director Steve Kruger and Hood River District Ranger Janeen Tervo. A celebratory stewardship day followed on the trail, and so began a new era for this wonderful trail. TKO and the Forest Service are planning other new trails in the area, so hopefully Old Vista Ridge marks the beginning of a trail renaissance on Mount Hood. The Old Vista Ridge Trail is snowed in for the winter, now, but you can visit most years from mid-June through October to admire the view and the new, official trail signs! 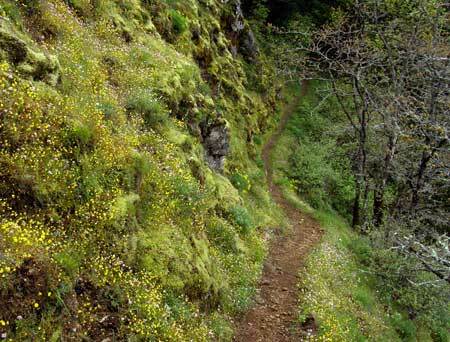 Read more about the trail in the Oregon Hikers Field Guide. Not far from Old Vista Ridge, another “lost” spot was saved in 2015 when the Western Rivers Conservancy rescued it from Weyerhauser through a direct land purchase. Western Rivers later sold the land to Hood River County at a deep discount, thanks to a Oregon Parks and Recreation Grant, which in turn was submitted on behalf of the county by another non-profit, Thrive Hood River (then called the Hood River Valley Residents Committee). Trailkeepers of Oregon (TKO) was in the mix, too, offering to build a trail system in the new county park as part of matching contribution toward the state grant. Sound complicated? It was! But the good news today is that most of the trails envisioned in the original park concept are now complete, and can be explored today. There are still a few finishing touches (notably, trail signs, which are currently in progress thanks to a Hood River scout troop — this is very much a DIY park! ), but the main pieces to this new nature park are in place for all to enjoy. The main focus of the new park is dramatic Punchbowl Falls, a powerful waterfall on the West Fork of the Hood River that has carved an enormous amphitheater from solid basalt. The area just below the falls is also reserved for tribal fishing, a native tradition here that spans millennia and continues to plays a central cultural and economic role for local tribes. When the new trail network at Punchbowl Falls Park was first scouted in 2016, great care was taken to respect fishing paths used by the tribes to access the falls, while also providing a way for park visitors to enjoy the many views in this beautiful canyon. Another goal was to consolidate the confusing maze of user trails in the area. All of the work was completed by volunteers from 2016 through last fall. The newest trail was completed last November, and follows the West Fork to the confluence of the East and West Forks of the Hood River, another popular feature in the park. Though the trails won’t be signed until early next year, they’re easy to follow and explore, and the park is especially peaceful in winter if you’re looking for a quiet walk in the forest. 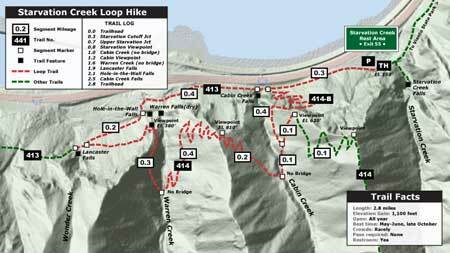 You can read about the hike here in the Oregon Hikers Field Guide. The new Punchbowl Falls Park spans roughly two miles of river, forever protecting land that had been left to the mercy of private timber corporations for more than a century. As if to underscore this point, Weyerhauser promptly logged off an entire hillside that rises directly above the new park before the site had even been transferred to county ownership. Thankfully, they spared the Punchbowl property from a similar fate before selling it to Western Rivers. Another big change over the past decade came to perhaps the most popular trail on Mount Hood, the venerable Mirror Lake trail, located near Government Camp. For nearly a century, this beloved trail to a small mountain lake was a “first hike” to thousands visiting the mountain for the first time, including me! A series of early articles in this blog focused on an ill-conceived ODOT project to widen Highway 26 in the Laurel Hill section, just west of Government Camp. The original Mirror Lake trailhead was part of the collateral damage of this now-completed road widening project. Even before the widening project, ODOT began closing the old trailhead during the winter months, cutting off access to legions of snowshoers and skiers who had used it for years. Later, the widening project finished the job permanently, and the old trailhead is now closed – including removal of the old footbridge over Camp Creek. While ODOT focused on highway widening, a little known federal highway agency known as the Federal Lands Division worked with the Forest Service to design and build a new Mirror Lake trailhead at the west end of the Mount Hood Ski Bowl parking lot. This arm of the Federal Highway Administration also oversaw the recent replacement of the White River Bridge and restoration of the Historic Sahalie Falls Bridge, near Hood River Meadows. The new Mirror Lake Trailhead opened just a few weeks ago, and was immediately filled to overflowing with visitors. I’ll post a proper review of the new trailhead and trail once the snow melts this year, but perhaps the best outcome is restored winter access to the Mirror Lake area. 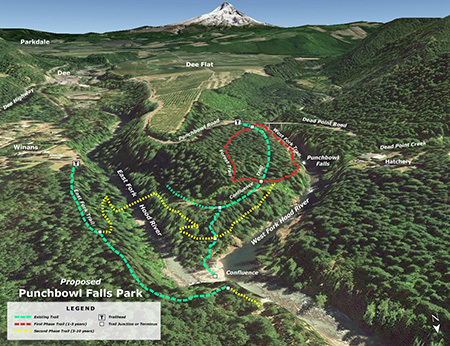 Another important element of the project is a barrier-free design from the trailhead to a new footbridge over Camp Creek, a much-needed addition to the very limited number of accessible trails in the Mount Hood area. One of the more profound changes of the past ten years came when President Obama signed a major wilderness bill into law in 2009 that greatly expanded wilderness protection in the Gorge and around Mount Hood. That law protected several small areas on the margins of existing wilderness that had been left out of earlier legislation. 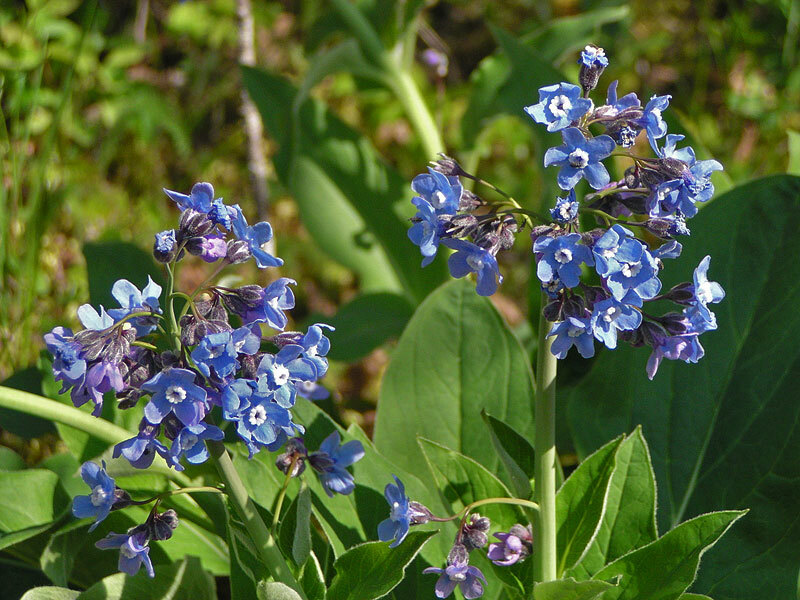 One such area is along the western margins of the lightly visited Salmon Huckleberry Wilderness, which ironically is the closest designated wilderness to the Portland metropolitan area. The expanded boundary incorporates forested slopes of Wildcat Mountain and McIntyre Ridge that had long been tempting targets for Forest Service timber sales. At about that time in the late 2000s, the Bureau of Land Management abruptly closed a northern access point to the Salmon-Huckleberry Wilderness, where an old logging spur provided access to the McIntyre Ridge Trail. Hikers soon discovered a new way to access McIntyre Ridge from another logging spur located on Forest Service land, which in turn led to an ancient roadbed from a long-ago era when a forest lookout tower stood on Wildcat Mountain. The Forest Service still has not embraced the “New McIntyre Trailhead”, as it is known to hikers, but this unofficial trailhead has restored public access to this newly protected corner of the Salmon Huckleberry Wilderness. More importantly, this is an area where “eyes on the forest” are especially important, as the Wildcat Mountain area has a long history of lawlessness and abuse from shooters, dumpers and 4-wheelers. The good news is that hikers have continued to use the McIntyre Ridge trail over the ensuing years, though there are still too many reports of illegal activity. Just last summer, a local hiker came across a pair of pickups that had driven at least a mile into the Salmon Huckleberry Wilderness along McIntyre Ridge and set up a camp in the middle of the trail! Worse, off-roaders have cut completely new roads into the wilderness on the margins of the Salmon Huckleberry, especially in this area. These are federal crimes, of course, though Forest Service resources for enforcing the law are minimal. Fortunately, public land law-breakers are well aware of their illegal behavior and tend to shy away from busy recreation areas. Therefore, my hope is that the Forest Service will eventually recognize and champion the New McIntyre trailhead as for protecting the wilderness through “eyes on the forest”. More to come in future articles on this little corner of Mount Hood country..
And the next 10 years..? Looking at the many profound changes in the Gorge and around Mount Hood over the past ten years, it’s easy to feel a bit overwhelmed and discouraged by the pace and scale of change. The 2017 Eagle Creek Fire was especially traumatic for so many who love the Gorge. But the changes are also a reminder of the ongoing need for vigilance in protecting these special places and the role we all have to continue moving Mount Hood and the Gorge toward a new vision of restoration and renewal and away from our exploitive, often destructive past. I’m optimistic that we’ll continue making progress in coming years, just as we have over the past decade that I’ve documented with this blog. I plan to continue posting articles here to track the changes and make regular deep dives into the lesser known corners of the Gorge and Mount Hood. And I’ll also dream a bit about how we might better care for these places that we all love while making our public lands more accessible to everyone. Hiking with Mom on Park Ridge in my formative years! Over the course of the past ten years, I’ve tried to post at least once per month, but you might have noticed that I haven’t quite kept that pace over the past year or two. That’s largely due to the fact that my elderly folks have suddenly needed more help as they both struggled with failing health. In September, my mom passed away after a long and cruel struggle with memory disease, so we’ve now shifted to supporting my 89-year old dad as he adjusts to suddenly living alone after 68 years of marriage. While sorting through family memories of Mom, I came across a photo (above) from a family backpack through the Mount Jefferson Wilderness, way back in 1974 when I was 12 years old. I was already an experienced hiker and backpacker at that point in my life, thanks to the love of the outdoors my Iowan parents shared in their beloved, adopted Pacific Northwest. That’s a precious gift my folks gave to me and I’m thankful every day for my good fortune to have been raised with boots on my feet and a pack on my back! Too many in our spectacular corner of the world take our public lands for granted, and barely make the time or effort to explore them, often because they don’t really know how to. That’s another motivation for the blog and the Mount Hood National Park “idea campaign”. Our public lands are a gift for all of us, and I’ll also continue to post articles that celebrate this legacy and provide tips for how to explore the lesser-known corners of WyEast country. Older, grayer but ready for another 10 years of celebrating WyEast! Well, that’s probably more than enough for this retrospective article. But if you’re read this far, thank you for taking the time to visit the blog and especially those who’ve reached out with a comment or e-mail over the years. Much appreciated! I’ve got a bunch of articles and a few surprises in the works heading into 2019, and I’m looking forward to another 10 years! I hope to see you here along the way — and on the trail, too! The first part of this article focused on the missed opportunity to restore Warren Falls as part of construction of the most recent phase of the Historic Columbia River Highway (HCRH) State Trail. This article takes a look at this newly completed section of trail. In October, the Oregon Department of Transportation (ODOT) opened the latest section of the HCRH State Trail, a segment stretching from the trailhead at the Starvation Creek wayside west to Lindsey Creek. A portion of this newest section follows the original highway grade where it passes Cabin Creek Falls, but most of the route is a completely new trail – or more accurately, a paved multi-purpose path open to both hikers and cyclists. The new HCRH trail segment begins in a small plaza constructed at the south edge of the Starvation Creek wayside. Early plans called for a complete reconstruction of the parking area, but budget constraints intervened, and most of the work here is along the margins of the existing parking lot. The trailhead plaza features some to-be-installed interpretive signs in the shade of a group of bigleaf maple trees, a pleasant meeting spot for hikers or cyclists. Missing from the revamped trailhead is the original Forest Service trailhead sign that once pointed to Warren Falls (below). It’s unclear if this sign will be reinstalled, but given that Warren Falls, itself, was not “reinstalled” as part of this project, the chances are probably slim. This sign has gone missing! The sign actually referred to what is now called Hole-in-the-Wall Falls, where Warren Creek emerges from the diversion tunnel built by ODOT in 1939. The unintended reference to the original falls made for an inspiring Forest Service gaffe for advocates of restoring Warren Falls! The first few yards of the new trail generally follows the existing route along the Starvation Creek wayside freeway exit ramp. It’s still a noisy, harsh walk through this area, but ODOT has dressed up this section with a sturdy cobble wall and new paving. The trail concrete barricades along this section that protect the trail from freeway traffic also feature the same decorative steel fencing found elsewhere on the HCRH State Trail, giving a bit more sense of separation from speeding vehicles. The new trail is also slightly elevated here, reducing the noise impacts somewhat from the old trail that was mostly at the ramp grade. 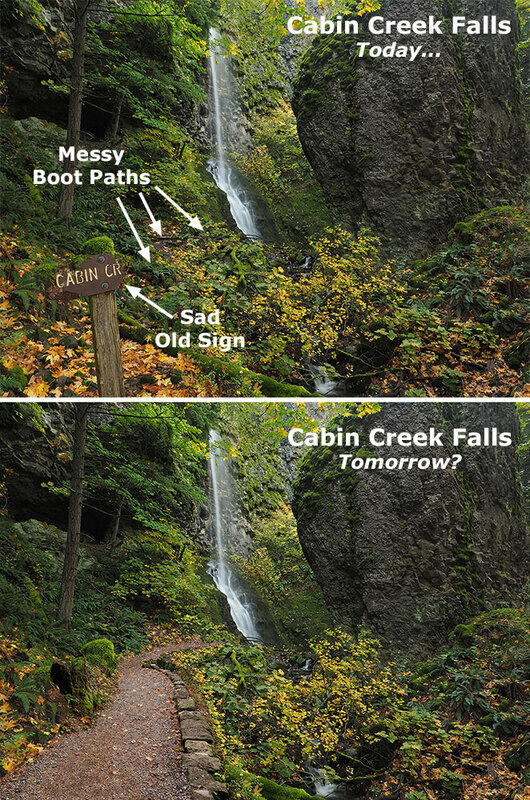 Soon, the new trail drops to the only original section of Columbia River Highway on this restored section of trail, where the old road passed in front of Cabin Creek Falls. An elegant but confusing signpost has been added at the junction with the Starvation Ridge Cutoff trail, pointing to Gorge Trail 400, which currently does not exist in this section of the Gorge. I didn’t hear back from ODOT as to whether a trail renumbering is in the works that would extend the Gorge Trail to Starvation Creek, but it may be that the Forest Service is planning to stitch together a extension of the Gorge Trail from pieces of the Starvation Ridge and Defiance Trails. That would be a welcome development! Trail 400..? Is a trail re-numbering in the works? 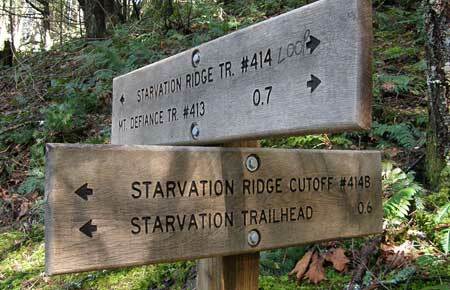 The location of the new sign almost suggests that the infamous Starvation Cutoff trail – one of the steepest in the Gorge – would be renumbered as the Starvation Ridge trail, with the bypassed section of the current Starvation Ridge trail becoming Trail 400. Confused..? 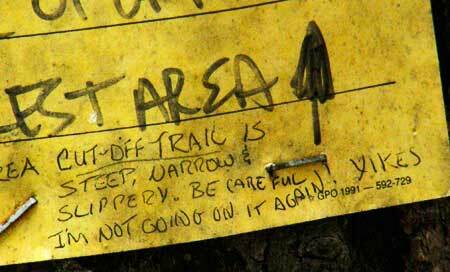 So are many hikers who visit the area with its already confusing trail network. So, keep your fingers crossed that the Forest Service is rethinking trail numbers and signage in conjunction with the new HCRH trail. For now, the actual Starvation Cutoff Trail has not changed, though HCRH workers added a nice set of steps at the start of this very steep route. The old pavement in this original highway section was resurfaced with new asphalt as part of the project, but otherwise the route here is much as it was when the highway opened in 1916, including a roadside view of Cabin Creek Falls. However, ODOT missed an opportunity to organize the hordes of visitors who now scramble to the falls along a cobweb of boot paths. Formalizing a single spur with a properly constructed trail (below) would be a great project for a non-profit like [link]Trailkeepers of Oregon (TKO)[/link] in conjunction with Oregon Parks and Recreation (OPRD), who now manage the trail and adjacent park lands. Cabin Creek Falls is popular with families (where kids can safely play in the basalt-rimmed splash pool) and photographers (who love this delicate, mossy falls). For many casual visitors, this is already the turn-around point on their walk from the trailhead, with Cabin Creek being the highlight of their experience, so a spur trail would be a nice addition to allow visitors to get off the pavement and explore a soft trail. ODOT also cleaned out the large, stone culvert (below) where Cabin Creek flows under the HCRH State Trail. This display of original dry masonry was mostly buried in debris and undergrowth until the trail project was constructed, so the restoration provides a nice look at the craftsmanship of the original highway. As the new trail route reaches the west end of the original highway section, ODOT thoughtfully place a small memorial (below) in the paving – a nice historic reference to the original highway. As the new route leaves the beautiful, forested section of original highway at Cabin Creek, it suddenly follows the freeway for about 200 yards due to steep slopes along the Gorge wall. This jarringly noisy section could use some replanting to at least create a visual buffer from freeway traffic. Soon, the new HCRH route thankfully curves back into the forest on a surprisingly massive structured fill. This structure was required to maintain the modest trail grade as the route climbs from the freeway shoulder to a slight rise near Warren Creek. This section is bordered with stained wood guardrails, a new design that departs from the vintage-style white guardrails in other sections of the restored highway, but provides a nice aesthetic that will also be easier to maintain. ODOT was careful to document cultural resources along the route when designing the new trail, including a set of stone ovens built by the original highway masons who camped here during highway construction in the early 1900s. The historic ovens are better protected than before by the raised trail design and guardrails (below), though still fully visible for those who know what they’re looking for. One disappointing detail along this section of trail is a long gabion basket wall (below), apparently constructed to catch loose debris from an adjacent slope. The steel cages holding this wall together will hopefully be covered in moss and ferns in time, but for now it’s an eyesore on an otherwise handsome section of the trail. Would Sam Lancaster have approved of a wire mesh gabion wall..? Another sore thumb in this forest section is a rusty mesh fence (below) along the freeway right-of-way that should have at least been painted, if not completely replaced as part of the project. Maybe ODOT still has plans to replace this eyesore? As the new section of the HCRH State Trail approaches Warren Creek, it enters a significant cut section to maintain its gentle grade. Thankfully, a huge anthill along this section was spared, one of the interesting curiosities along the former soft trail that used to pass through this forest. The view below was taken during the construction looks east at the cut section along the new trail. Because the rustic forest trail that once passed through this area was completely destroyed by the new HCRH trail, the reconfigured landscape will be a shock for hikers who hiked the trail in the past. Though hydro-seeded with grass, this section could benefit from some re-vegetation efforts to further speed up healing. Beyond the cut section, the new route crosses the original channel of Warren Creek, and for those with a sharp eye, a pair of cobble foundations for early homesteads that once lined the creek. Here, the trail reaches a half-circle bench where an all-access side trail curves up to the viewpoint of Hole-in-the-Wall Falls (more on that later in this article). It’s unclear if interpretive signs will be added to this area, but at one time the story of how Warren Creek was diverted in 1939 was planned for the spot where the new trail crosses the old, dry creek bed. Another new trail sign is also located at the all-access spur trail to Hole-in-the-Wall Falls, as this is also the route to the Starvation Ridge and Defiance Trails. This sign also includes a mysterious reference to Gorge Trail 400, further suggesting that a re-numbering of trails in the area is in the works. A large, multi-trunked bigleaf maple was also spared at this junction. Bigleaf maple spared… and another mystery reference to Trail 400..? The following view is looking from the new HCRH State Trail toward the Hole-in-the-Wall spur trail, showing the proximity to Warren Falls. The green hydro-seeded area in the photo is where the construction staging area for the project, underscoring the missed opportunity to restore Warren Falls as part of the project – it was just a few yards beyond the staging area. Staging area during construction in July – the last time we’ll see heavy equipment this close to Warren Falls for generations? The humble elderberry (below) in the middle of the staging area was spared by ODOT, a nice consideration in a project that did impact a lot of trees. Hopefully, there are plans to expand native plantings here, as this area was covered with invasive Himalayan blackberries for decades before the trail project and will surely revert to invasive species without a deliberate restoration effort. This apparently well-connected elderberry dodged the ODOT bulldozers! Moving west, the new HCRH State Trail segment passes through another forested section where the trail rises on fill necessary to bring it to grade with a handsome new bridge over Warren Creek (visible in the distance in the view, below). This is an especially attractive section of trail. For some reason, many of the trees that were cut for this new section of trail were left piled along the base of the fill (below). The fill slope has been hydro-seeded, so it seems unlikely that the more work is planned to remove or repurpose the log piles, so apparently the were left in this manner on purpose? Looking back to the construction period last summer, you can also see the good work ODOT did to cut back English ivy that was rampant in this area. While ivy was left intact on the forest floor, it was cleared from dozens of trees in this section of the trail. The highlight of the new HCRH trail segment is where the route crosses Warren Creek. Here, a handsome new bridge faithfully echoes the design ethic of Samuel Lancaster, but is probably more elaborate than the original bridge constructed at Warren Creek in 1916. Lancaster’s bridge was destroyed when the first version of the modern highway was built in 1950. Though no visual record exists, the original Warren Creek Bridge was modest in length, at just 18 feet, and likely resembled the surviving bridge at Gorton Creek to the west, or possibly the original bridge at Viento Creek to the east (shown below). The design of the original Warren Creek Bridge inadvertently helped lead the Highway Department to bypass Warren Falls, as stream debris was clogging the bridge opening. The 1941 project files also describe the original bridge being “replaced in a different location” as part of the diversion project, so there may have been two version of the original bridge over Warren Creek before the modern highway was constructed in the 1950s. Construction of the new HCRH bridge over Warren Creek was an involved undertaking, with the surprisingly wide span leaving plenty of room for a (someday) restored Warren Falls to move 70+ years of accumulated rock and woody debris down the stream channel. There’s nothing natural about Warren Creek in this area, as it looks (and is) more like a drainage ditch. This is because original streambed is now a dry ravine several hundred yards to the east, and the current streambed is where the Highway Department moved the creek decades ago, when the modern highway was first built in the 1950s. As described in the first part of this article, the someday restoration of Warren Falls will once again allow rocks and woody debris to migrate into the lower channel, eventually transforming the “ditch” into a healthy stream (below) that can fully support endangered salmon and steelhead. 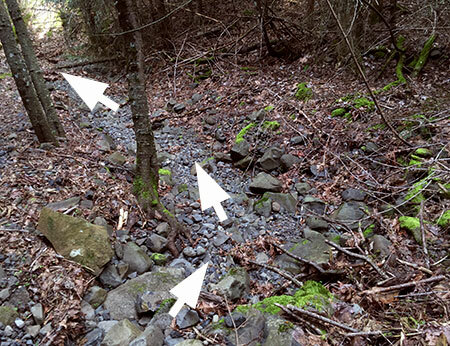 While ODOT missed the larger opportunity to help this stream restoration along when it declined to restore Warren Falls, the agency also missed the easy opportunity to simply add a few boulders and logs to the section of Warren Creek near the bridge when heavy equipment was in the area. That’s too bad, but perhaps the OPRD will someday enhance this stream section as part of managing the new trail. From Warren Creek, the new trail follows another fill section to a mostly obstructed viewpoint of Lancaster Falls on Wonder Creek from a small seating area. This viewpoint (below) could use some light pruning to reveal the falls, and perhaps something that’s still in the works by OPRD. One oddity about Wonder Creek is that it mostly disappears into ground before reaching the culvert that carries Warren Creek under I-84 and to the Columbia River. This is partly due to the modest flow from spring-fed Wonder Creek, but also because the slopes below the falls are mostly composed of unconsolidated talus covered with a thin layer of soil and vegetation. 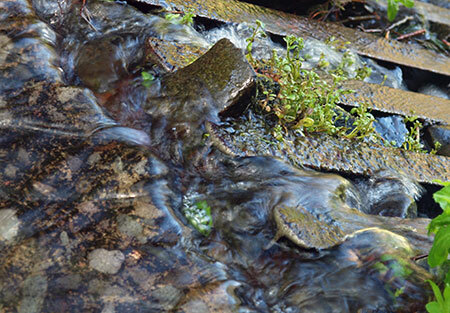 So, most of the time the stream is simply absorbed into the water table below the falls. Yet, in high runoff periods, the new state trail will accommodate the flow with extensive drainage features designed to carry Wonder Creek under the fill section and to the Warren Creek freeway culvert. Another oddity of Lancaster Falls is its illusive nature. Though thousands of hikers each year view the modest, 20-foot lower tier of the falls where it spills across the Defiance Trail, few know of it’s full extent – and perhaps wonder why Samuel Lancaster wasn’t honored with a more spectacular landmark. While it’s possible to scramble to the base of the main tier of Lancaster Falls, the slopes are unstable and already being impacted by off-trail visitors, so it’s probably best that only a most portion of the falls is (somewhat) visible from the new HCRH route. Hopefully, interpretive signage is in the works for the viewpoint that tells the story of Samuel Lancaster..? From the Lancaster Falls viewpoint, the new trail heads west to a section where it once again follows the shoulder of I-84 to Lindsey Creek and the end of new construction. ODOT is working the next trail segment, which will connect from Lindsey Creek to the Wyeth Campground, crossing the base of famously unstable Shellrock Mountain along the way. One of the design highlights of the new HCRH trail section is a short all-access spur tail to an overlook of Hole-in-the-Wall Falls, the man-made outflow tunnel that continues to drain Warren Falls of its water. The completed overlook has been scaled back from its original design (shown above), and now features one of the signature circular seating areas, complete with a picnic table (below). A small plaque at the viewpoint identifies Hole-in-the-Wall Falls, which until now has not been an officially recognized name or has appeared on any official maps. A nice nod to the origin if the “falls” is the byline “Created 1939”. Hopefully, there will be future interpretive displays here, as the story of Warren Falls would be a great addition to this overlook. The Starvation Ridge Trail picks up from the south side of the Hole-in-the-Wall Falls overlook, heading across a footbridge over Warren Creek. A closer look near the footbridge (below) reveals a surprising disappointment: the stump of a streamside Douglas fir cut improve the view of the falls. It’s too bad that the tree wasn’t simply limbed to provide a view, as it was one of the few larger trees stabilizing the banks of Warren Creek. Hole-in-the-Wall Falls bridge… and stump? While it’s disappointing to think about the opportunities missed at Warren Falls, the Hole-in-the-Wall Falls overlook and beautiful new Warren Creek Bridge, are still a big a step in the right direction toward someday moving Warren Creek from neglected afterthought to a valued resource that deserves to be restored. ODOT deserves major kudos for their thoughtful work on this section of trail! I’ve heard this reaction to the State Trail from many hikers over the years, as avid hikers are often aghast at what they see as more of a “road” than trail. 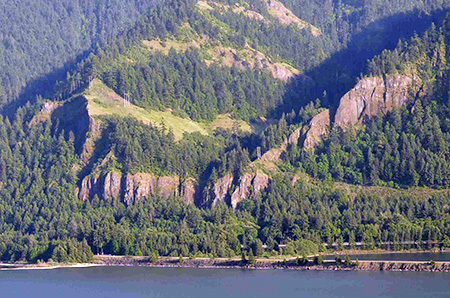 The scope of construction impacts on the natural landscape of the Columbia River Gorge National Scenic Area (CRGNSA) and the millions in public funds being spent on the project rankles hikers who don’t see themselves actually using the trail. Many hikers are also mystified as to how this project can received tens of million in funding while other, heavily overused Gorge trails are falling apart for lack of adequate funding. These reactions are understandable, if misguided. The restoration of the surviving HCRH and the future trail segments that will soon complete the original route from Troutdale to The Dalles is an epic effort of ambition and vision in an era when both are rare quantities. When the route is completed, it will become a world-class cycling attraction, and it is already drawing visitors from around the world. Guided bicycle tours have become a thriving business in the Gorge because of ODOT’s commitment to bringing the HCRH State Trail vision to reality, and businesses in Gorge towns are already seeing the benefits. Other projects to promote the trail are also in the works. ODOT’s Gorge Hubs project is a new partnership with six cities in the Gorge to provide traveler information for trail users and boost the local economy. 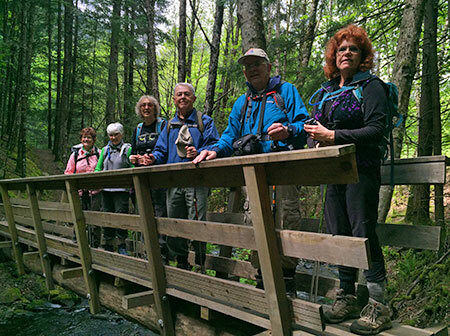 The Friends of the Gorge have launched the Gorge Towns to Trails project, a complementary effort to the HCRH State Trail to connect Gorge communities to public lands via trails. Plenty of local visitors will continue to use the HCRH State Trail as the project nears completion over the next few years, but the real benefit for Gorge communities is from visitors coming from outside the region. Unlike local visitors, tourists coming from elsewhere will book hotel rooms, purchase meals and take home locally-made products and art from the Gorge to memorialize their trip. These visitors make a much larger contribution to the Gorge economy than a local visitor who might stop by a brewpub on the way back from a day trip. A 2011 National Park Service study of tourism dollars shows outside visitors spending anywhere from 7 to 12 times the amount that local visitors spend on a visit to a given park, bringing hundreds of millions to local economies at many parks. There’s no reason why the Gorge can’t better manage the our already heavy demand from local visitors to the Gorge to allow for more outside visitors drawn by the HCRH State Trail to spend their dollars here. 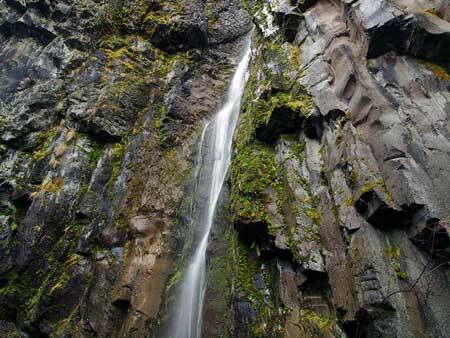 The bigger picture is that anyone opposed to seeing casinos or bottled water plants in the Gorge should be part of supporting a tourism economy that builds on the scenery. 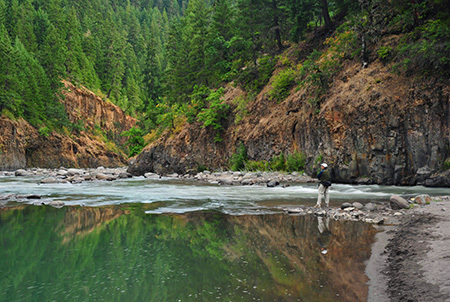 Yes, tourism impacts must be managed to protect the Gorge for future generations, but the health of the Gorge economy is the essential ingredient to providing these protections over the long term. The HCRH State Trail is part of that formula, and it deserves enthusiastic support from anyone who loves the Gorge. If you own a bicycle (or pair of walking shoes), give it a try — and then recommend it as an exciting new vacation destination to distant friends and family! 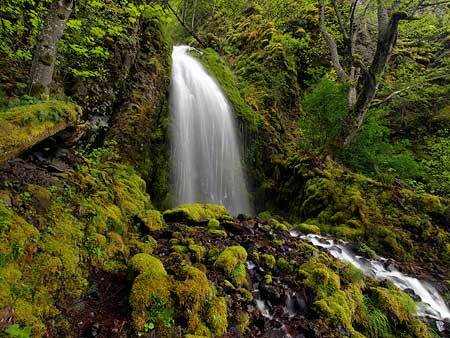 The campaign to restore Warren Falls in the Columbia River Gorge is over, at least for now. The Oregon Department of Transportation (ODOT) is putting the final touches on the latest section of the Historic Columbia River Highway (HCRH) State Trail, from Starvation Creek to Lindsey Creek (more on that in part two of this article), and undoing their diversion tunnel at Warren Falls was not part of the deal. While Warren Creek now has an especially handsome bridge on the new state trail, the dry cliffs of beautiful Warren Falls (below) will continue to be a ghostly testament to the arrogance and carelessness of our modern age – except on those rare stormy days each winter when the falls briefly reappears (above). Restoring the falls would have been the perfect companion to the HCRH State Trail project, itself an epic restoration project. Samuel Lancaster would surely have approved, too. It was a once in a century opportunity to do the work while heavy equipment was right in front of the falls. But if fighting City Hall is an uphill battle, then the castle walls at ODOT are still more foreboding. The agency isn’t a monolith. There was encouragement and support from sympathetic professionals at ODOT along the way, albeit plenty of opposition from others. In the end, the agency formerly known only as the Oregon Highway Department revealed its roots, reluctant to step beyond its narrow right-of-way. And yet the Historic Highway State Trail project, itself, is a bold step forward from simply building highways, and one the agency has been truly committed to. Thus, I’m hopeful about ODOT’s future, and the new state trail has much for us to be proud of. Perhaps most disappointing is ODOT’s lack of ownership and sense of responsibility for a stream diversion project that today would be considered a crime against nature. Even when Warren Creek was diverted and the falls destroyed in 1939, it was jarringly at odds with the vision and reverence for the landscape of Samuel Lancaster’s Columbia River Highway, and should have sent up red flags for the Highway Department. Still more astonishing was learning during the course of this project that none other than Conde McCullough – engineering deity to many as the designer of Oregon’s most treasured highway bridges of the 1920s and 30s – signed off on the diversion project while serving as chief engineer! Worse, we also learned along the way that it was completely illegal to destroy the falls, even back in 1939, as revealed in this article on the blog. 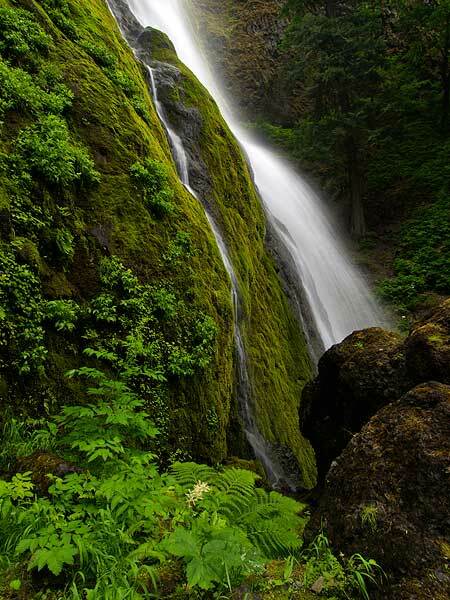 Oregon wasn’t a very big place back then, so it’s hard to believe the law protecting the falls went unnoticed at the time… but the truth on that point will likely never be known. Perhaps the greatest irony in the Warren Falls saga is that the original diversion project was designed to protect one the bridges on Sam Lancaster’s famous new road – by destroying one of the more spectacular waterfalls along the route. Lancaster died in March 1941, so it’s doubtful that he was even aware of the project as it moved forward in 1939. Let’s hope so, anyway. Today, the crumbling diversion dam and tunnel are still listed as “assets” by ODOT, but are really just orphans, and now all but forgotten by the agency for the foreseeable future. Short of Oregon Parks and Recreation (OPRD) taking on the decommissioning as part of some sort of larger Warren Creek restoration project, the most likely outcome is continued deterioration of the diversion structure until nature finally reclaims it. So, the campaign to restore Warren Falls is over… or is it? After years of attending meetings, writing letters, giving tours to all manner of advocates and officials and even a segment on OPB’s “Oregon Field Guide”, there weren’t many stones left to turn in coaxing ODOT to bring Warren Falls back to its original glory. On the surface, there’s very little to show for the effort. But is that really true? It depends on how you define victory. Yes, in the immediate future ODOT will continue to treat Warren Creek like a glorified storm culvert, and the former Warren Falls will continue to be a depository for “trash” (what the original engineers called the rock and woody debris we now know are essential to a stream health) separated from the creek’s flow. That’s a shame, and a missed opportunity for the agency to show that it has evolved from its “Highway Department” past. But over the past five years, tens of thousands of people have learned the story of Warren Falls thanks to the OPB coverage, thousands more have viewed the WyEast Blog stories here and on the Restore Warren Falls Facebook page, and hundreds have visited the falls site, with more making the side trip each year to pay homage to what once was – and will be, again. Until they see the silent cliffs where Warren Falls once flowed, most of these visitors have no idea that today’s Hole-in-the-Wall Falls is simply a man-made attraction that came at the cost of destroying Warren Falls. Armed with the history of Warren Falls, few who visit can view it as anything less than an environmental tragedy. So, despite losing this round, Warren Falls has a lot of new friends, and a lot of people who love the Gorge have gained a better understanding of the lasting cost of “progress” and the chore of undoing our handiwork, even in places we seek to protect most. Oh, how I wish I could share all of the schemes for liberating Warren Falls that have come my way over the past five years! They range from temporary performance art to more permanent alterations that would probably be illegal… if any governing entities were actually concerned about the fate of Warren Falls. Still more surprising is the range of Monkey-Wrench-Gang-wannabes who proposed taking the restoration of Warren Falls into their own hands: you’ll just have to use your imagination, but some were rather prominent folks who left me speechless with their audacious plans. NONE OF THESE ACTIVITIES APPEARS TO BE LEGAL, at least not without prior permission from the OPRD or ODOT (and good luck with that, by the way), and therefore the following DOES NOT CONDONE OR ENDORSE these ideas in any way! Whew. Okay, well one of the most popular schemes is to roll plastic tarps over the giant “trash rack” that forms the screen over the Warren diversion tunnel. This would allow the pristine waters of Warren Creek to ride a plastic liner above the tunnel and over the natural falls. Sort of a giant slippery-slide, but with a real surprise at the end! Someday (on my deathbed, or possibly at the dedication of a restored Warren Falls?) I may reveal an especially prominent individual who personally pitched a version of the slippery slide to me – truly, one of the more unexpected twists in this five-year saga! Most versions of the slippery slide focused on getting a really good look at what an unaltered Warren Falls looked like via a temporary restoration. But Warren Creek gets pretty wild and wooly in winter, so this would likely be a very brief restoration. There’s also the question of what would happen to the tarps, once swept away, as there is a lot of potential for adding more man-made junk to an already defaced stream (assuming the tarps didn’t get hung up on the cliffs or left hanging form the outflow to Hole-in-the-Wall Falls). Others suggested (WyEast Blog Legal Department repeat notice: not condoning this!) speeding up the “weathering” process that has already begun to expose and compromise the steel beams that form the “trash rack” at the top of the falls. It turns out that in just the ten years since I’ve been advocating to restore the falls, this part of the diversion has shown noticeable deterioration, and seems to be speeding up. It turns out the top of the “trash rack” is the weakest point in the design, and is steadily unraveling. So, I’m not sure Mother Nature needs much help at this point, despite the enthusiastic volunteers out there. The motive for speeding up the release of the beams varies among schemes and schemers. 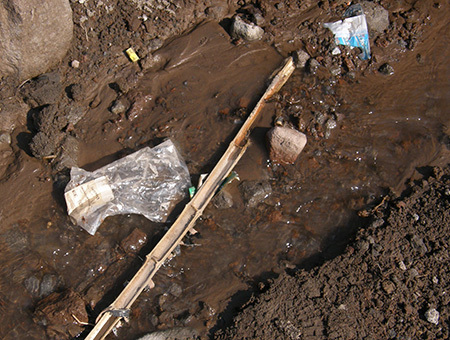 One version is to allow enough stream material to pass under the protective “trash rack” to plug up the surprisingly narrow diversion tunnel leading to Hole-in-the-Wall Falls. Which is just 60” in diameter. This is probably what Mother Nature has in mind, though it may take awhile. Another angle on speeding up the weathering at the top of the steel beams is to allow larger debris (logs, large rocks) to wedge between the beams, thus acting as levers to literally tear it apart with hydraulic pressure during high stream flow. To a large extent, this is already happening, as at least half the rack is plugged with smaller cobbles that are twisting and bending the steel beams with the effects of freeze and thaw during the winter months. At least one Warren Falls fan spotted the open vault above the west end of the diversion structure and suggested diverting the creek into this hole (WyEast Blog Legal Department reprise: this is not an endorsement! Plus, you might fall into a tunnel that spit out as a man-made waterfall! ), where it could move debris large enough to plug the bypass tunnel. I’m not positive, but I think solid basalt prevents this from happening – either through creative monkey-wrenching or courtesy Mother Nature. But I was impressed at the attention to detail from those who love Warren Falls! As much as I enjoyed hearing these inspired pitches for a DIY restoration of Warren Falls, one of the reasons I advocated for removing the “trash rack” structure and filling the bypass tunnel in an orderly way was to avoid having a bunch of steel debris entombed at the lip of this beautiful falls. I’d still much prefer a thoughtful decommissioning of the diversion over a disorganized mess – whether triggered by humans or nature. We owe it to future generations to do this right. And who knows, we may still get the chance! Short of an unforeseen intervention, the restoration of Warren Falls by forces of nature will take awhile. But it turns out that Warren Falls has some similarly trod-upon cousins in the area who have suffered flagrant abuse, then been abandoned to recover on their own. The good news: in all cases, nature is winning… albeit, very slowly. White River Falls needlessly goes dry each summer, thanks to a derelict Pacific Power diversion that sends the river around the falls (visible dropping in on the right). 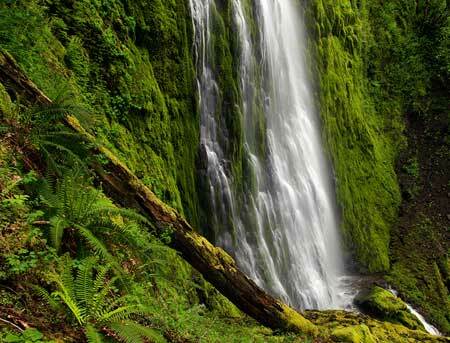 A spectacular example is White River Falls, located in a state park by that name on the east side of Mount Hood. The falls is just upstream from the confluence of the White River with the Deschutes River. More than a century ago, the Wasco Milling Company diverted much of the falls to a giant pipeline that fed a powerhouse downstream. Energy from the powerhouse was transmitted to The Dalles. Wasco Milling later sold the plant to Pacific Power, and it was finally shut down in 1960, when the land was transferred to the state of Oregon. Pacific Power left quite a mess behind. The abandoned power plant, numerous pipelines and the diversion dam all still survive on state park land today. During high runoff in winter and spring the diversion channel is overwhelmed, and the former glory of White River Falls is on display. But by late summer, the entire flow is still diverted into the bypass channel, tumbling around the falls where the diversion pipe once existed. In this way, the situation at White River is not unlike present-day Hole-in-the-Wall Falls burping out of the Warren Falls bypass tunnel where it once connected to a flume that carried the creek over the old highway and to the Columbia River. And like Warren Falls, the bypass channel “falls” at White River is a sad, ugly duckling compared to the magnificent original falls. But while there is no plan to formally decommission the diversion at White River Falls, the approach to the diversion dam is increasingly clogged with silt and debris, and should eventually fail, finally closing the chapter on the Wasco Milling Company era. A few years ago, I reported on a now-scrapped scheme by Wasco County officials to reboot the White River generating plant, proving once again the wise words of John Muir: “Nothing dollarable is safe.” Even in an Oregon state park, it turns out. 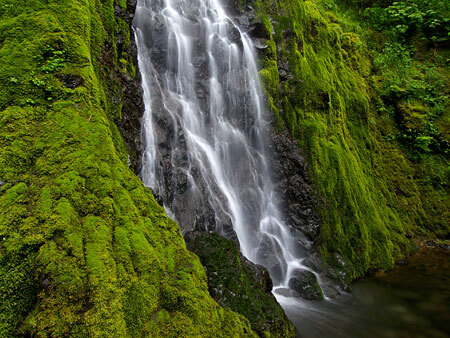 A closer cousin to Warren Falls is popular Bridal Veil Falls, located at the far west end of the Columbia Gorge. Though few of the thousands of visitors who hike to the base of Bridal Veil Falls each year can even imagine what this spot looked like just a few decades ago, it was one of the most heavily degraded areas in the Gorge. The lower tier of famous Bridal Veil Falls was altered for mill operations! Who knew? The mill town of Bridal Veil was once located just 100 yards below the falls, though the town is now nothing more than concrete foundations and rusted cables covered in moss and undergrowth. In this eastward view (below) from the early 1900s, today’s Bridal Veil exit from I-84 to Multnomah Falls would be located near the buildings at the far end of the mill town. The pile of rough-cut timber in the foreground marks the terminus of log flumes that fed the Bridal Veil mill. 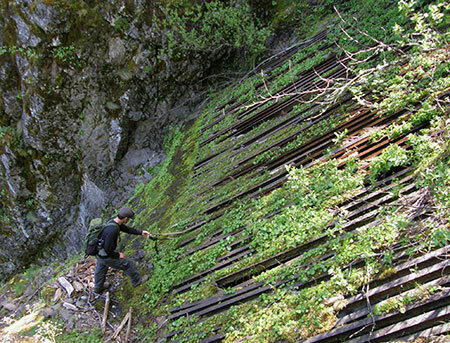 At least three timber flumes carried logs and rough lumber to the mill from the slopes of Larch Mountain. One flume closely followed Bridal Veil Creek with the kind of roller coaster ride theme park “log rides” have tried to replicate ever since. In the scene below (from about 1900) the audacious scale of the flume is evident as it courses down the canyon, about a mile above Bridal Veil Falls, and just below Middle Bridal Veil Falls. The area had already been heavily logged by this time and the stream was viewed as nothing more than a steady water source and convenient path for moving old-growth timber to the mill. This view (below) of the converging flumes coming into the mill site conceals Bridal Veil Falls, which is located directly beneath the flumes. Today’s trail to the falls would have travelled under all three flumes where they converge in this scene. The photo below shows the falls in the late 1800s, just before the lower tier had been raised about 15 feet, creating a pool below the upper tier and allowing for a diversion structure (?) to presumably carry a piped portion of the creek to the nearby mill. During periods of low water today, you can still see parts of the diversion structure at Bridal Veil Falls poking from the water (below). This rare view from the early 1900s shows the diversion structure already in ruins or perhaps under construction? In either case, its purpose only lasted a short period, and in this way the falls is a kindred spirit to Warren Falls, where the short-lived diversion functioned for barely a decade before becoming obsolete and abandoned. The cobble dam shortly after construction… or perhaps after it was abandoned? Today, there are still a lot of concrete and steel reminders of the mill town, though they’re often hidden in plain sight, under layers of rust, moss and ferns. For example, this view (below) of the stream below Bridal Veil Falls reveals a “boulder” that is actually a concrete footing and an intake pipe for one of the mill ponds. In more recent years, stolen automobiles have periodically been pushed from the cliffs along historic Palmer Mill Road into Bridal Veil canyon. Some of these dumped vehicles have been pulled from the canyon, but others are too difficult to reach, and are slowly fading into the forest. While they have undoubtedly released engine fluids into the creek and have plastic parts that will last for decades, nature and Bridal Veil Creek are nonetheless making short work of the rest of these vehicles. 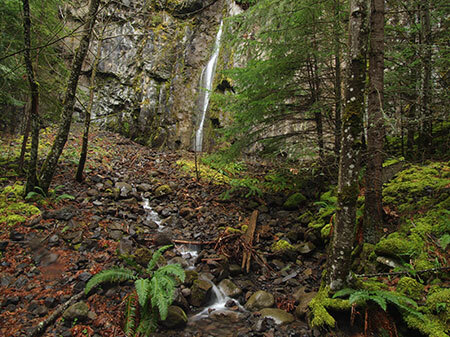 Unlike Warren Falls, the waterfalls on Bridal Veil Creek were never completely diverted from their natural streambed, yet the overall impact of logging and milling at Bridal Veil had a much larger impact on the larger watershed than anything Warren Creek endured. The fact that Mother Nature has consumed most of what wasn’t salvaged when the flumes were pulled from Bridal Veil canyon in the mid-1900s is an inspiration for the ongoing recovery of Warren Falls. In time, all traces of our impact on the environment really can heal – provided we allow it to happen. Responsibly cleaning up after ourselves would be a more noble path, of course, but at least nature seems to forgive us in time… so far. A few weeks ago, the local waterfall hunting community had a brief moment of excitement when a vintage 1918 film seemed to include a rare view of Warren Falls! But after looking more closely at the images, it turned out to be Horsetail Falls in very low flow. So, the hunt for a photograph of Warren Falls before the 1939 diversion project continues. But the similarity was real, so the following is a rough guess of what we might see – and perhaps, sooner than we think: Warren Falls flowing again, returning its amazing amphitheater to mossy green, as the diversion structure continues to crumble into history. For waterfall devotees, this is Horsetail Falls superimposed on Warren’s dry cliff with the reversed base of Dry Creek Falls providing the foreground. Of course, we already know what a small amount of flow over Warren Falls looks like during high runoff events, as shown in previous photos in this article. What we don’t know is what the full force of Warren Creek might look like coming over this 120-foot escarpment, and especially what it might do with 77 years of accumulated stream debris piled at the base of the natural falls. 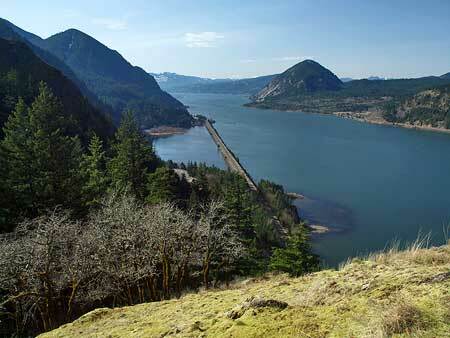 We have a pretty good idea, though, based on recent dam removals around the Pacific Northwest. 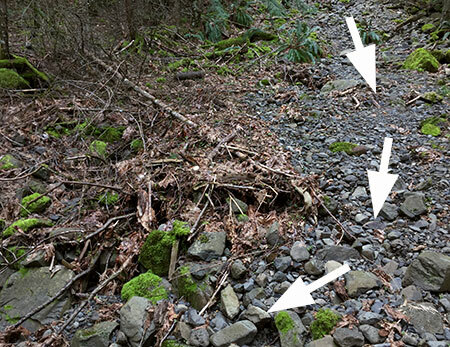 It turns out that streams are surprisingly quick to redistribute accumulated debris and restore themselves to their natural stream state, as we’ve seen with dam removals on the Hood, Little Sandy and White Salmon rivers. 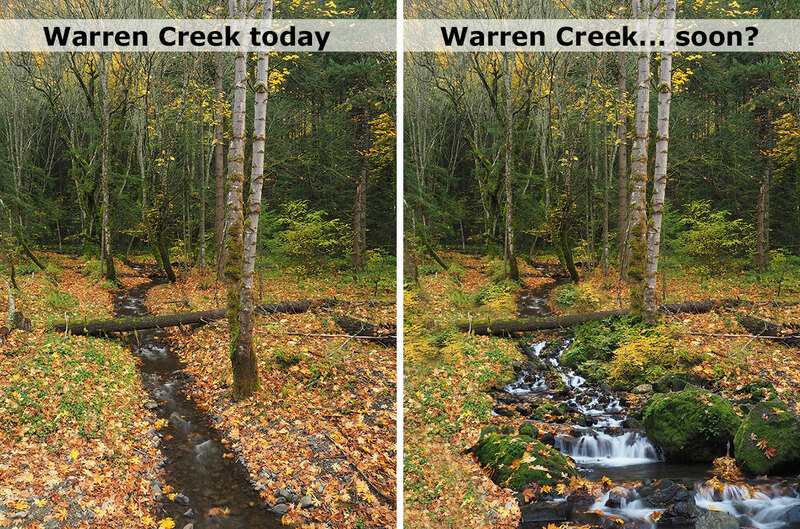 Today, Warren Creek below falls has been reduced to ditch, radically moved by ODOT from its former channel in the 1950s and devoid of the rocks and woody debris essential to a healthy stream since 1939, thanks to the “trash rack”. When Warren Falls returns, the huge pile of stream debris will begin to move downstream, and the debris-starved lower section of Warren Creek will develop the pools and eddies necessary for salmon and steelhead to spawn, as imagined above. The good news is that the new HCRH State Trail passes high and wide over Warren Creek, ensuring that the creek can evolve back to a natural state in the future without a redux of the 1930s highway impacts that led to the diversion of Warren Falls. When will Warren Falls return? Not just now… but perhaps sooner than we think. Meanwhile, we wait… and watch. Restore Warren Falls on Facebook! Cool news in the summer heat! Starting off with the big news, the folks behind the Punchbowl Park project learned in late June that they had been awarded a State of Oregon grant of $470,000. These funds will make it possible for Hood River County to acquire the 103-acre Punchbowl Park site in partnership with the Western Rivers Conservancy. This is a huge step forward for this citizen-led movement, a major grass-roots effort guided by Heather Staten of the Hood River Valley Residents Committee (HRVRC). Now that the future of the site is secure, Heather and her organization will be working with the county to begin building a recreational trail network through the new park for the public to enjoy. Much more work lies ahead for Punchbowl Park, and I’ll continue to post updates here on new developments and opportunities to get involved in the trail building over the coming years. Kudos to Heather and those who pitched in for the tireless work that made this happen. Bringing this area into public ownership is a once-in-a-lifetime opportunity, and one that will pay off for many generations to come! You can already explore Punchbowl Park in its undeveloped state now by following the maze of user trails that already exist there. You will likely notice signs of recent logging — part of an operation to remove diseased trees from the forest in hopes of limiting their spread. The long-term plan for the new park is to let nature take over, and allow the forest to recover to a more natural state after a century of timber harvesting. For a second bit of cool news, we move west to Warren Falls. In mid-July, I sent a “Hail Mary” plea to local legislators in the Hood River area asking for their (divine?) intervention to somehow prod the Oregon Department of Transportation (ODOT) into decommissioning the Warren Creek diversion tunnel and restoring Warren Falls. I’ve posted several articles on this proposal (as well as this Oregon Field Guide story) in hopes of doing this needed restoration work when the state will have heavy equipment in the area as part of the next phase of the Historic Columbia River Highway (HCRH) State Trail, which will soon cross Warren Creek. My plea for help was answered promptly and with enthusiasm by State Senator Chuck Thomsen of Hood River. Senator Thomsen agreed to me at the Starvation Creek Wayside early one morning last week for an inspection of the Warren Falls site and a briefing on my proposal to restore the falls. After our tour, he offered to write a letter to both ODOT and the Governor’s office asking them to put Warren Falls on their to-do list. Boom! More to come, but simply contacting a legislator has already triggered a call from an ODOT surrogate, essentially asking me to cease and desist in my efforts. I assured them that I had no desire to delay the larger state trail project, but still believe the agency should (and can) do right by undoing their illegal diversion of Warren Creek — and restoring Warren Falls in the process. I’m convinced that if ODOT channeled the spirit of Samuel Lancaster when he designed the historic highway a century ago, they would easily discover both the will and funding needed to make this happen. And if they do, Sam Lancaster will surely approve — wherever he might be! If you’re interested in more detail, here’s a (large) PDF of my Hail Mary! letter to Senator Thomsen. Five years ago, I posted this article challenging the Timberline Ski Resort on their practice of “conditioning” the Palmer Glacier with the equivalent of 500 tons (picture 500 pickup loads) of salt on the glacier each summer. To defend the practice, the resort points to water quality testing downstream showing only “reasonably elevated levels” of salt in the tributaries that feed into the Salmon River, as if there is something reasonable about purposely pouring salt into one of our premier rivers. 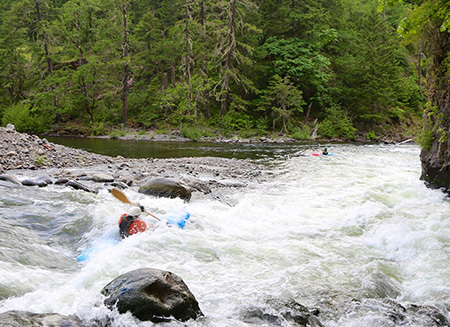 The Salmon River is not only treasured for its epic waterfalls and rugged gorge, it’s also a wild and scenic river and among the few salmon and steelhead streams in the Oregon Cascades with no downstream dams to block fish migration. There’s a lot at stake, here. The Forest Service, meanwhile, is also of the “well, let’s see what happens” mindset, and officially permits the Timberline resort to keep dumping tons of salt on Mount Hood most fragile glacier. 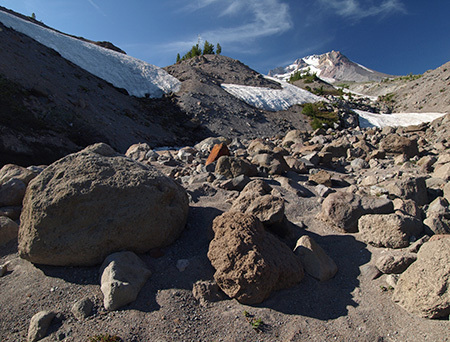 And yes, it’s still a glacier in name, though you may have noticed that the official media term coming from both the Timberline Resort and the Forest Service is the dismissive “Palmer Snowfield”. I can only guess the thinking behind this, but it’s hard to imagine it not being an attempt to downplay the impacts of salting the glacier. Meanwhile, the Palmer Glacier continues to shrink, along with the rest of our Cascade glaciers in this period of global climate change. The Timberline Resort actually posted a letter to President Obama on their website proclaiming their “strong support for policies to address climate change”, all the while purposely accelerating the melting of their bread-and-butter glacier. Given the contradiction, it’s fairly easy to differentiate the empty rhetoric from the short-term profit motives. How salty is this runoff from the Palmer Glacier? Enough for the Timberline Resort to be on the defensive, apparently. Ski areas don’t just bring invisible pollution to the Salmon River — here, a broken boundary pole and ski trash litter the Salmon River headwaters. The greatest tragedy is that we own the land and the glacier, not the resort. They’re simply leasing the space. So, after the glacier is gone, we’ll own the polluted alpine slopes left behind by the salting practice — as the effects of salt pollution are long-term in nature, and of little concern for ski resort balance sheets or Forest Service concession permits. So, where’s the cool news in this story? Just that the Timberline resort is closing down the Palmer ski season this weekend — a full month before their advertised “June through Labor Day” summer season concludes. 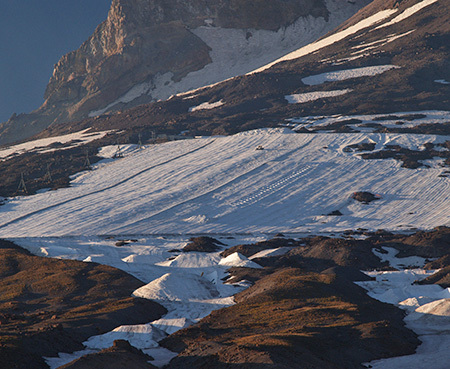 The Palmer Glacier won’t miss those snowcats, skiers or tons of salt this August! This bit of good news for the Palmer Glacier and Salmon River is real: it translates into hundreds of tons of salt that won’t be spread on the glacier over the month of August this year, and that in turn equals less salt in the river and fragile alpine slopes in a dangerously low water year. It might even mean less melting of the glacier than might happen otherwise. 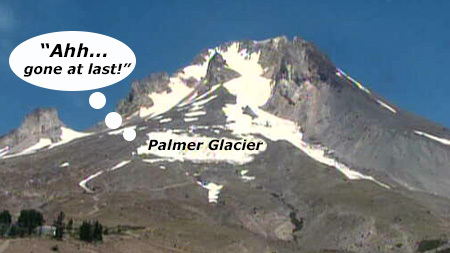 So, it’s cool news of a sort… and might just help keep the Palmer Glacier around just a bit longer. Time is running out on the Restore Warren Falls! project. 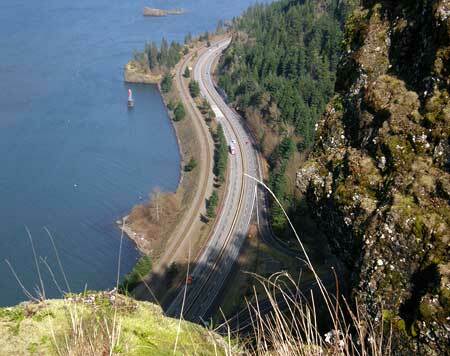 This summer the next phase of the Historic Columbia River Highway (HCRH) State Trail project will begin construction of a segment that will pass right in front of the falls. 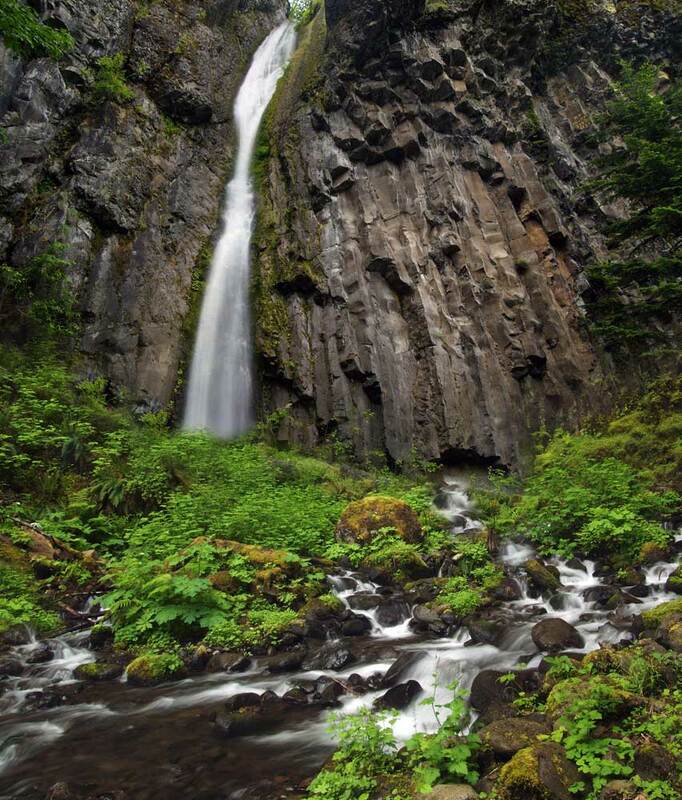 The new trail construction in the area is not simply an ideal opportunity to finally undo what the Oregon Department of Transportation (ODOT) did to this magnificent waterfall 76 years ago — it’s probably the only opportunity in our lifetimes. In that spirit, I thought an update on the project and Warren Falls was in order — plus share a bit of a bombshell that was sent to me recently! First, a quick visit to Warren Creek: in mid-April I made a couple visits to Warren Falls as part of my twice-annual Friends of the Gorge hikes. As has become the norm in recent years, the natural falls clearly flowed again this winter during heavy runoff that overwhelmed the diversion weir at the top of the falls. The Friends of the Gorge hikers always marvel at the strange, unsettling scene of a dry waterfall. Like most who visit Warren Falls, many are also saddened by the idea that the ODOT could have been so cavalier in altering such a beautiful scene at Warren Creek so grotesquely. While the original decision to divert the falls can arguably be blamed on the thinking of the era (late 1930s), I would submit that allowing this tragic mistake to continue to exist is equally cavalier and dismissive of the natural landscape at Warren Creek. Thus, my campaign to attach the burden of undoing the mess at Warren Falls to ODOT — and in particular, their looming state trail construction project that will soon begin in the area. 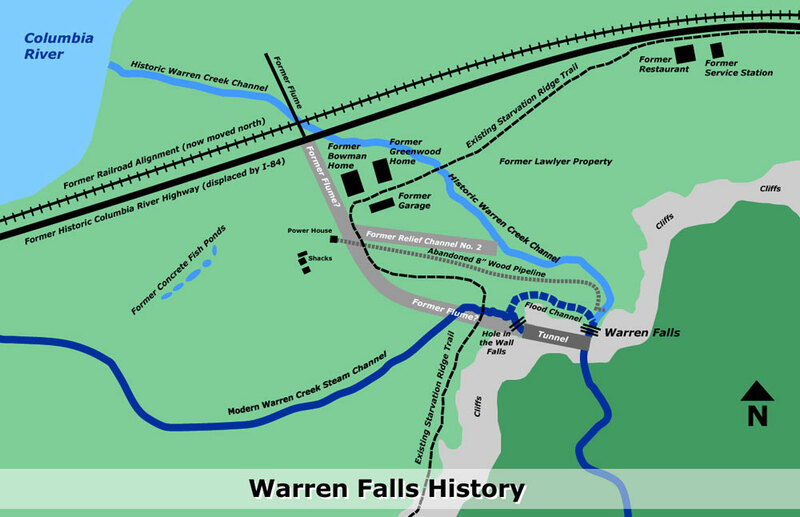 While researching Warren Falls over the winter, I finally found a definitive story on the official naming of the creek. The name “Warren” comes from Warren “Barney” Cooper, and early forest ranger in the Mount Hood area (and part of the Cooper family described in this previous article). So, we now learn that Warren Lake and creek were once called “Warm Lake” and “Warm Creek”. Warren Lake is situated on a high, rocky shoulder of Mount Defiance, and shallow enough to be “warm” in late summer, so that could be the simplest explanation for this early name. The name “Warren” appears on maps and early documents from well before this 1948 decision, so the timing of the article is interesting, especially so long after Warren Cooper’s death in 1920. 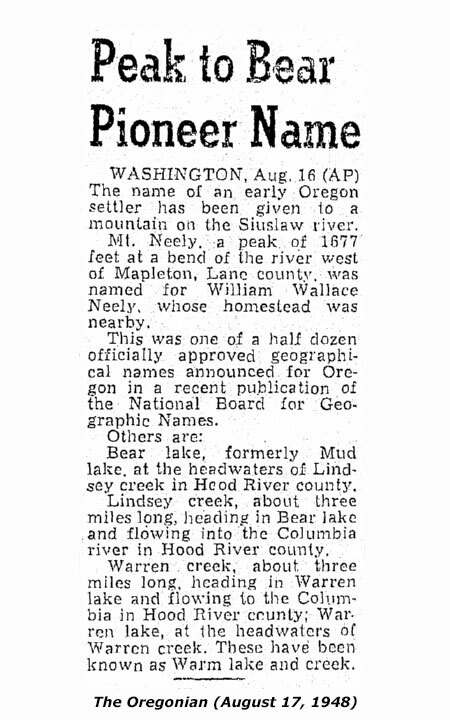 Was the naming in 1948 simply cartographic housekeeping or an overdue recognition of a pioneering forest ranger by those who followed him? As always, every answer brings a few new questions! Friends of Warren Falls… are everywhere! 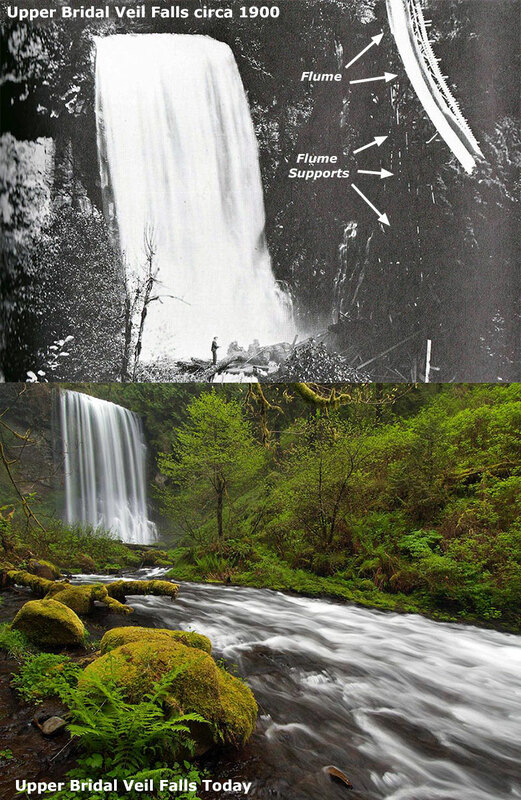 Since the Oregon Field Guide story on the Restore Warren Falls! project first aired the fall of 2012 (watch the documentary here), several anonymous “friends” of Warren Falls have quietly contacted me with offers to help. More importantly, I’m concerned that formally removing the weir and associated debris will become increasingly difficult if the structure is further compromised. I’ve therefore thanked the monkey-wrenchers for their passion, but encouraged them to be patient and allow the slow wheels of government to turn a bit further..! 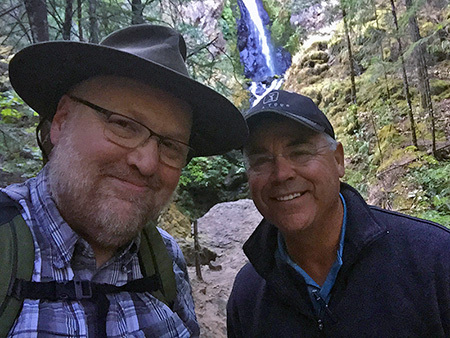 Another piece of information that trickled in from an anonymous attorney and friend of Warren Falls is found in plain sight: in the Oregon Revised Statutes. Specifically, ORS 538.200, which exists solely to prohibit the diversion of “streams forming waterfalls near the Columbia River Highway” for “any purpose whatsoever”. While quite clear in its intent, this might seem like a very general reference. But the statute (which was signed into law in the early 1900s, before the Warren Falls diversion) goes on to list each of the streams and waterfalls that fall under this protection — including Warren Creek, in ORS 538.200(26)! What does this new information mean? For starters, it means that ODOT — at the time, called the Oregon Highway Division — broke the law in 1939 when it blasted a diversion tunnel and erected a dam and weir to pipe Warren Creek away from its natural falls and streambed. That is quite clear. What is unknown is whether the ODOT decision to defy the law in the late 1930s was brazen in its intent. As hard as that possibility is to believe, it is also very hard to believe the agency wouldn’t have known about the law, given that it had been enacted just a few years prior the Warren Falls diversion project being concocted in the early 1930s — and was specifically aimed at the state’s premier highway of the era. What does it mean today? In my view, it means that ODOT now has BOTH a legal and ethical responsibility to undo what it has done to Warren Falls. That couldn’t be more clear. 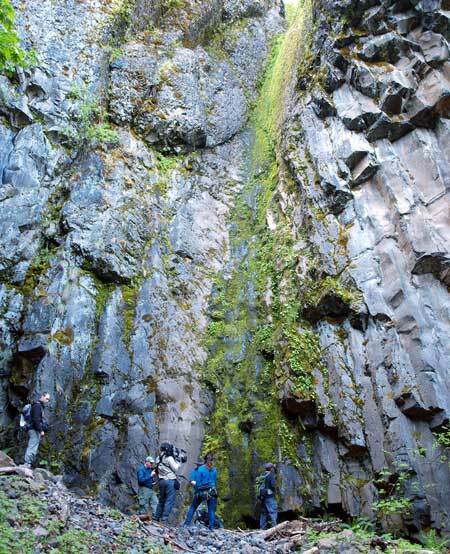 • unsuccessfully pitched the cause to three of the premier conservation groups active in the Gorge, including on-site tours, but did not persuade any of the groups to adopt the cause. 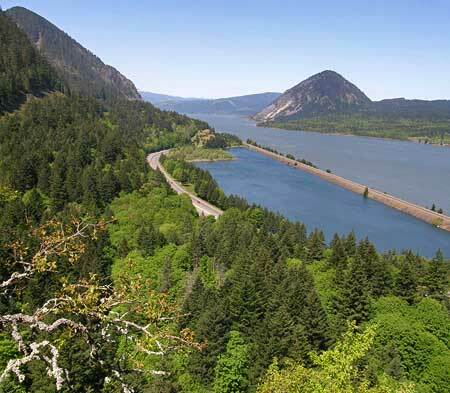 • unsuccessfully made the case twice before the Historic Columbia River Highway steering committee, with some sympathetic interest from the committee, but a deep reluctance to seriously consider the idea. It was added as an item “for consideration” — but later dropped due to cost concerns. • successfully pitched the idea to the producers of Oregon Field Guide story, and while ODOT staff involved in that effort were sympathetic to the state of Warren Falls, the publicity created by the story did not change their recommendations to their steering committee for any further consideration of restoring the falls. • posted a string of articles on this blog and started a Facebook group two years ago to continue to rally the cause, but these efforts haven’t made a noticeable dent at ODOT, either. 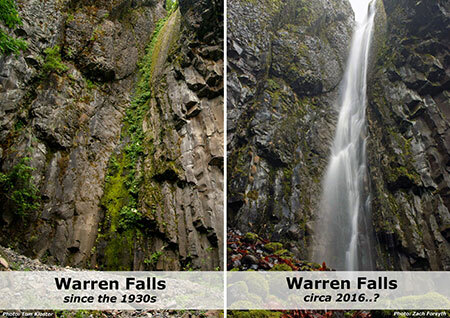 We are now in the end game, and I don’t think the Warren Falls will ever be restored if the work doesn’t happen when ODOT has heavy equipment in the area later this year. After that, it will most likely be up to Mother Nature, and that’s would be such a sad commentary to future generations when they judge the state of the world we choose to leave them. From the beginning, I have argued that restoring the falls isn’t about money, but rather, about responsibility. ODOT created the mess that now exists at Warren Creek, and for a whole variety of safety, ethical, environmental — and now, legal — reasons that I’ve argued over the years, it’s time for the agency to own up to their responsibility. 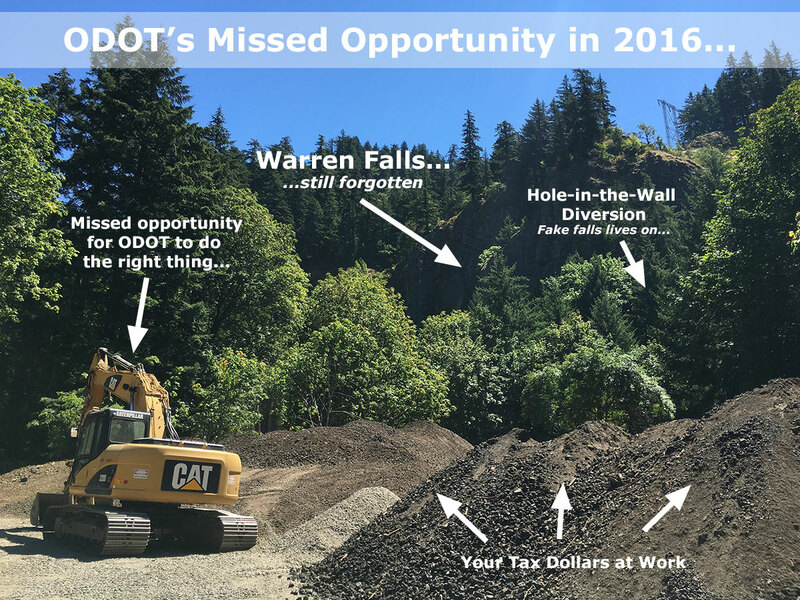 No fooling, ODOT has $2 million annually in a “contingency” fund for exactly the kind of work that restoring Warren Falls would entail — and just allocated another half-million dollars to cover additional costs for the state trail project in the Warren Creek area. It turns out the money has always been there, too. 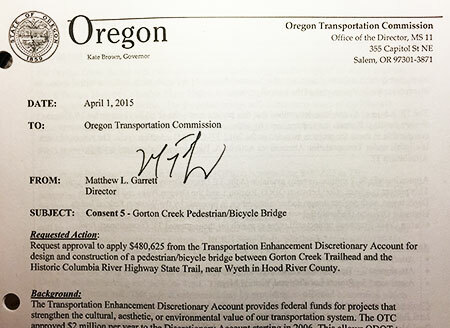 On April 1, ODOT quietly pulled nearly a half-million dollars in “contingency” funds into this latest phase of the state trail as a consent item before the Oregon Transportation Commission. The new money is for a previously unplanned bridge over nearby Gorton Creek, a worthy addition at the east end of the current phase of construction. Warren Falls could be restored for a fraction of that amount – if only the will and sense of agency responsibility at ODOT existed. My next efforts will focus beyond ODOT, given my fruitless efforts to work with the agency. At the top of my list of arguments is the newly discovered fact that the agency violated state law when they built the project in 1939 — underscoring the notion that ODOT has both ethical and legal obligations to own up to restoring the falls. The agency clearly has funding available for worthy efforts like this one if the desire exists. I will be making that argument, as well. There’s still time to realize this vision… but not much. I’ll post a follow-ups to article with more details soon, and especially how you might be able to help get the restoration of Warren Falls unstuck from our state bureaucracy. Most of all, a big thanks to all who have offered to help — and as always, thank you reading this blog and caring about Mount Hood and the Gorge! 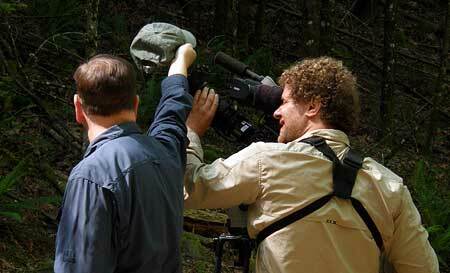 Warren Falls story airs October 25th on Oregon Field Guide! If you’ve followed this blog for awhile, you may remember this article from last spring. 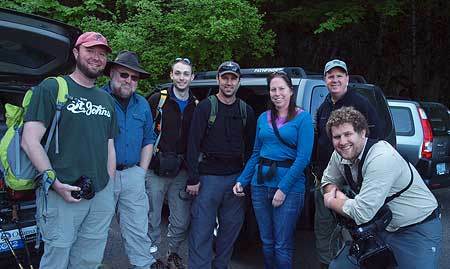 This earlier article documents the field shoot at Warren Falls for a story on OPB’s Oregon Field Guide. 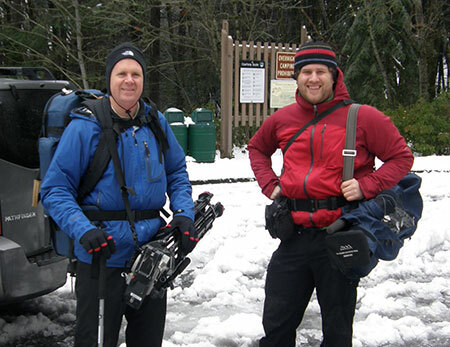 Thanks go out to Vince Patton and Michael Bendixen, the brave OFG crew who made a couple of trips to Warren Falls to capture the story. Along the way they braved an ice storm, waded through knee-deep poison oak, dodged cliffs and dangled beneath the huge “trash rack” that covers the top of the Warren Falls diversion. They are true adventurers to the core! The crew spent two separate days on site, and captured what should be some very intriguing views of the Warren Falls diversion structure — including that glimpse under the weir, looking into the tunnel. The video from our earlier, icy winter trip should be interesting, with some surprises, I suspect.